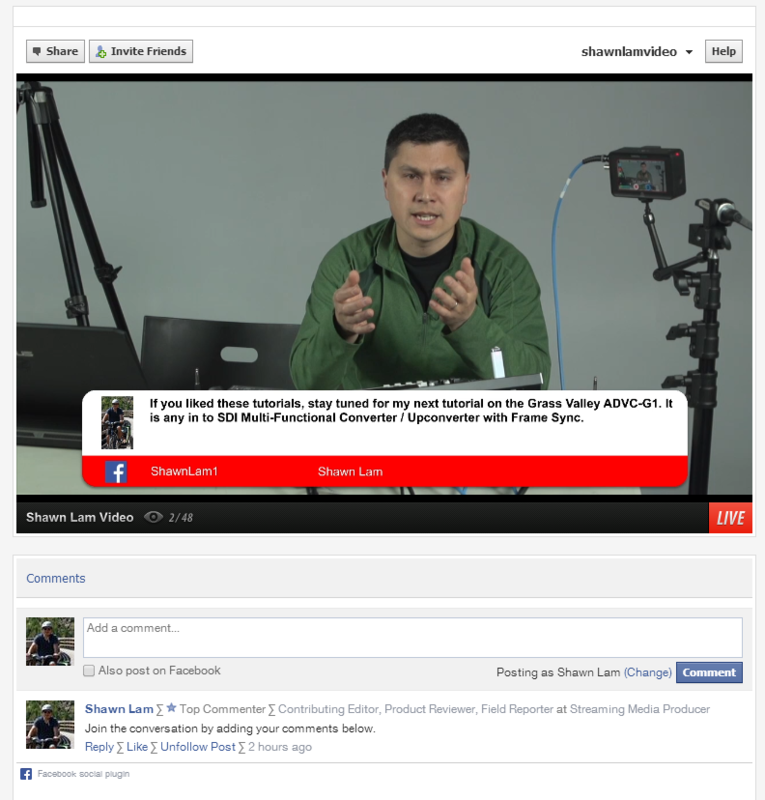 How to Integrate Real-Time Social Media with Streaming Video – Vancouver Video Production Company – Shawn Lam Video Inc.
As a society, we recognize that our interactions compete for time with ever-present Internet-connected smart phones and tablets. Be it in a classroom, conference, or boardroom, or while out for dinner with friends and even first dates, we vie for attention with connected devices. Broadcasters and advertisers know this as well as anyone. As the primary vehicle of TV consumption has shifted from live television to on-demand streaming and timeshifted playback of live television using a PVR, advertisers understand that in order to capture viewers’ attention, they need to engage them on their second screens–their smart phones and tablets. This effort to engage viewers on their second screens can be seen in the form of strategically timed Twitter hashtags that often summarize a storyline with run-together compound words. This type of interaction is normally limited, although I have seen some shows like ABC’s The Voice read live tweets from viewers and display tweets supposedly written by the show’s quartet of celebrity coaches. Admittedly, the celebrity tweets appear to be written by social media handlers via the celebrity’s Twitter account, but The Voice still represents a solid example of broadcast television trying to engage the viewing audience on their second screens while they watch live television programming. Likewise, a webcast that properly integrates real-time social media with streaming video can replicate this type of Twitter interaction and take engagement and the conversation to the next level by adding Facebook comments. Ironically, as television consumption has morphed into an on-demand and timeshifted experience, live streaming or webcasting—i.e., web video viewing in real-time—has become a growing market. Corporate webcasting is often used to connect remote employees or conference attendees in remote or satellite locations, and technology companies are increasingly webcasting product launches. Like broadcast television, today’s live webcasts often integrate real-time social media with streaming video in an effort to engage their viewing audiences. Engaging webcast viewers via social media results in higher viewer retention, because they stick around longer. It also means higher visibility, and consequently higher viewer numbers, as these viewers share their engagement activities across their social media networks. There are two ways to integrate real-time social media in live streaming video. The first is by engaging viewers through the use of chat, Facebook comments, and tweets. The second is by compositing Facebook and Twitter comments on the live video. I will discuss and demonstrate both methods. Encouraging viewers to share, like, and tweet the live broadcast URL is a good start, but true engagement requires interaction. Both Ustream and Livestream have channels and event pages that allow Facebook comments/likes/shares, Twitter tweets, and chat. It’s important to assign a moderator to monitor these different interaction methods to prevent conversations that are too risqué for the intended audience and discourage trolls and bots. This communication channel can also double as a way for the webcast team to communicate with the viewing audience for technical support issues without interrupting the flow of the live webcast or involve the talent. It can also be used to send clickable web links that aren’t possible when you overlay a URL on live video. If the webcast is going to be hidden from an event page or channel or simulcast via an embed code on a client website, social media functionality can still be maintained, depending on the embed code option selected. Additionally, both Ustream and Livestream have Facebook apps that allow the video to be embedded on a Facebook page, which adds a third simulcast location. My initial concern with multiple simulcast locations is that the different audiences wouldn’t be interconnected, but Facebook comments are seen across all three simulcast locations, which has the added benefit that the moderator doesn’t need to be in three web locations at once. 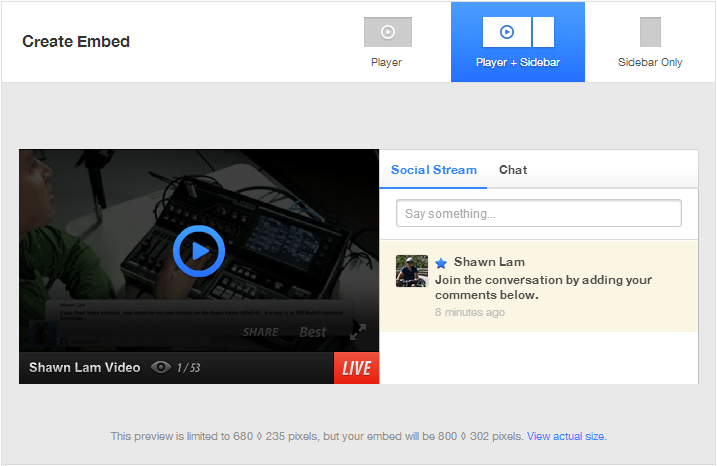 Ustream embed options include the video player only, player plus sidebar, and sidebar only.